This video shows the disturbing truth hidden in the data, which is that while Arctic sea ice extent (the area of ocean covered by ice) has been declining at 13% per decade (in summer, 3% in winter), the volume and age of the ice have been declining more rapidly. 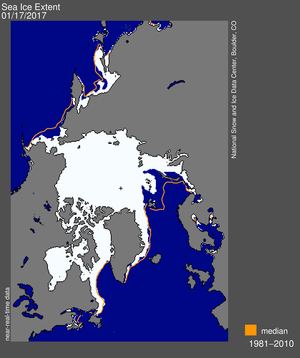 Whereas in 1987 there were extensive areas of the ocean covered by thick, sturdy ice 10 years or older, by 2013 that type of ice is nearly extinct. Most Antarctic sea ice is first-year ice to begin with, so once it is gone from the Arctic it is probably not coming back in our species’ lifetime.